2011 • documentary • 43 / 53 minutes. Director Gulya Mirzoeva • editing Gisèle Rapp-Meichler • cinematographer Alexeï Morozov, Dmitri Kabakov and Olivier Chambon • sound Timour Deyanov and Olivier Dandré • music Evgueni and Sacha Galperine. 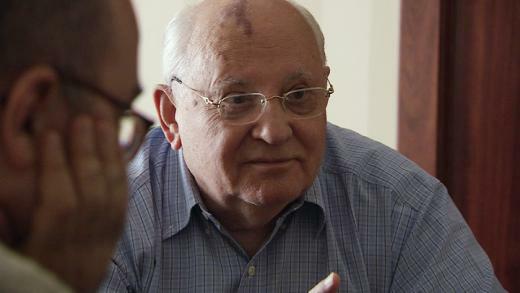 Mikhail Gorbachev is a typical product of the communist system. He was head of the Kremlin from 1985 to 1991, reformed an ailing regime, and has become an outcast in his own country since the collapse of the USSR. So who's he really ? Approaching his 80th birthday, the last head of state of the USSR agreed to talk about the most important periods of his existance and to reveal telling details of his life, his youth and the corridors of power. Coproduction .Mille et Une. Films / ARTE France / Focus Pictures. With support form CNC, Région Bretagne, Procirep - Société des producteurs and Angoa. Sales : France 5, Channel 8 (Israel), NRK (Norvège), SVT (Suède), TV Cultura (Brésil), RSI (Suisse), Lisboa TV (Portugal), Bulgaria On Air Tv (Bulgarie).